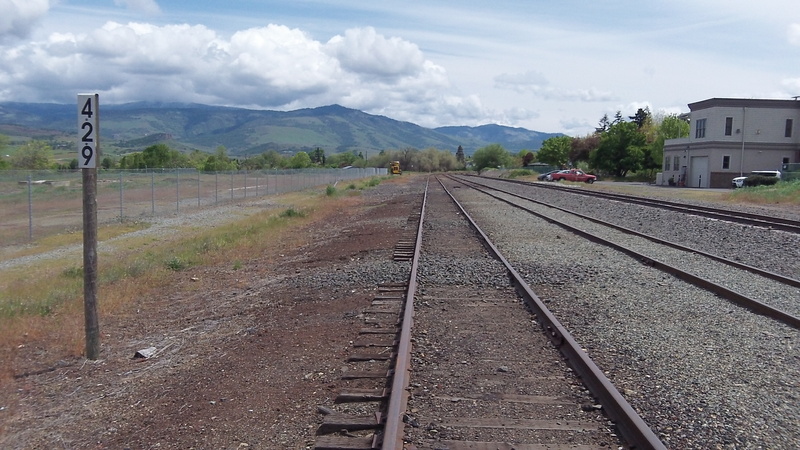 The Ashland rail yard, 429 miles from SF and quiet now, may see some traffic starting this fall. If you’re a rail buff like me, you’ll no doubt be watching TV on Monday night when Oregon Public Broadcasting presents a program on the DeAutremont brothers’ murders of four crew members of a Southern Pacific express on the Siskiyou line in 1923. And you may be interested to learn this rail line, unused since 2008, may once again carry trains by this fall. When I worked at the daily paper in Ashland in the 1970s, the Oregon PR man for the Southern Pacific once arranged for me and our paper’s photographer to hitch a ride on a freight on the Siskiyou line. We climbed into the caboose at the Ashland rail yard, then spent a few hours being pulled along that steep and serpentine track up the mountains. 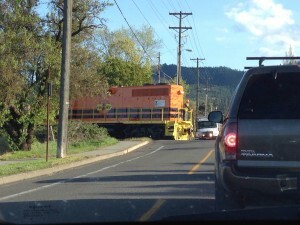 Then we nervously watched smoke pouring from the brakes under the cars as the engineer slowed the train down on the descent toward Yreka and Weed. That used to be the main link between Portland and San Francisco until the line through the Cascades, from Eugene to Klamath Falls, was opened in 1927. The Central Oregon and Pacific took over the Siskiyou line from the SP in the 1990s and in 2008 quit using it because of its poor condition. 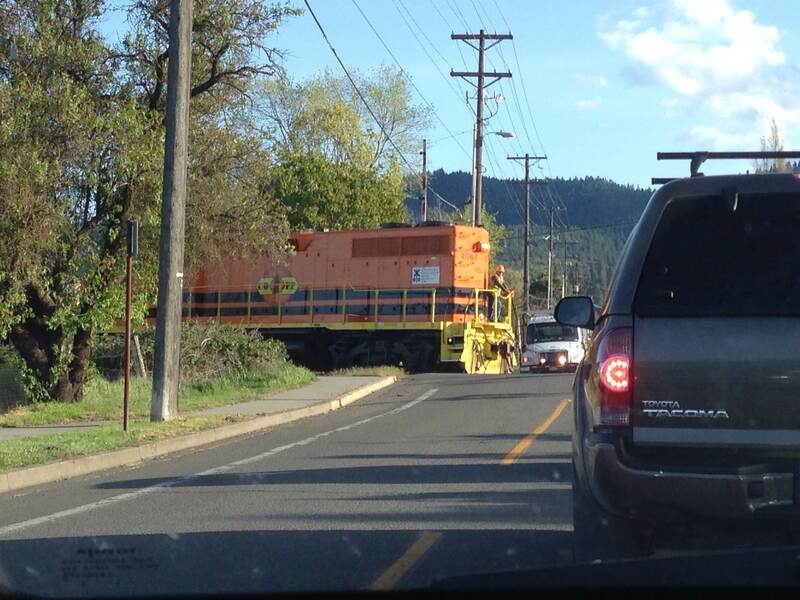 Dave Hering got this shot of a CORP work train inching across Mountain Avenue in Ashland in early April. Now the line is being rebuilt. Some $7.1 million of the cost is being borne by a federal grant under a program known as TIGER IV, which stands for Transportation Investment Generating Economic Recovery. Arguing that the line is important to carry wood products from Southern herpes simplex Oregon to the national rail network, Southern Oregon counties, private industry and Siskiyou County had asked for the federal help. CORP, now owned by the Genesee & Wyoming railroad company, which also owns the Portland & Western, is paying 25 percent for a total project cost of about $9.5 million. The job is to be completed this fall and covers 65 miles of track including rails, ties, some bridge work and one tunnel, Tunnel 14. It was at a different tunnel, No. 13, where Roy, Ray and Hugh DeAutrement held up Train No. 13 on Oct. 11, 1923. They hoped to steal gold from the mail car. Instead, they ended up dynamiting the car, killing postal clerk Elvyn Daugherty. Then they gunned down brakeman Charles Orin. Before they fled, they also shot to death Sydney Bates, the engineer, and Marvin Seng, the fireman. The event has been called the last great train robbery in the West. There was nothing great about it. What these inept brothers committed was a cruel and unbelievably stupid crime. After a long manhunt the brothers were caught and sent to prison. For years, it is said, Southern Pacific engineers would give extra blasts of their horns as they passed the state penitentiary in Salem. They were letting the DeAutremonts know that railroad men had not forgotten their crime. I expect the OPB program will cover that and other details of the story, including Governor McCall’s pardoning of Ray, who by then had been on parole and working quietly as a janitor at the University of Oregon. I read an interesting account of the DeAutrement Bros. crime some time ago. The story is interesting in unusual ways despite (or because of) being such a senselessly heinous act and tragically bungled to a similar degree. As I recall, the tunnel (support timbers) caught fire and burned for some time as a result of the explosion. Train and tunnel both numbered 13?? Didn’t know that. Thanks for the heads up on the OPBS show airing Monday. The DVR is set.